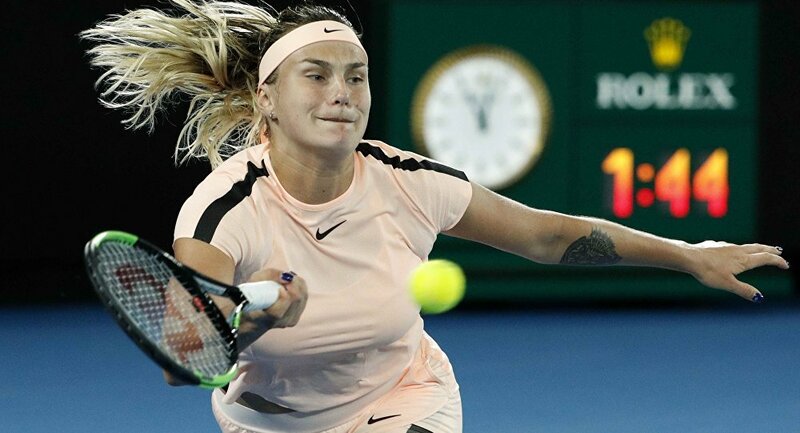 The crowd at the 2018 Australian Open showed no mercy on Aryna Sabalenka as they ruthlessly mimicked loud grunts of the hard-hitting teen player during her match on Tuesday night. On January 16, Ashleigh Barty beat Aryna Sabalenka in all three sets; however, this Australian Open match held in the Rod Laver Arena will most likely be remembered not for the Australian No1's victory but for the criticism levelled at her Belarusian opponent's grunting. — #7TENNIS 🎾 (@7tennis) 16 января 2018 г. As the 19-year-old pro tennis player from Minsk screeched after almost every strike of the ball against Barty, the pitiless audience started to openly mock Sabalenka's screams between points. "Ladies & gentlemen please, during the rally, do not scream." At one point, the umpire asked the viewers to stop imitating the sounds as a courtesy to the players but they only responded by making their grunts even louder. Barty, who was seen shaking her head, didn't seem to be pleased by the crowd's behavior at all. After the game, she was asked if her opponent's screeching had affected her. "I think if something that small can irritate you, that's a bigger issue in itself," she said. "I knew it was coming. I was prepared for it," the Australian player told the media as reported by Australian Broadcasting Corporation. People who watched the match on TV took to Twitter to express their concerns over the issue. — Adam White (@White_Adam) 16 января 2018 г. — Ben Rothenberg (@BenRothenberg) 16 января 2018 г. — Peter Brown (@SydneyEditor) 17 января 2018 г.
Tood Woodbrige, the former Australian doubles player, also shared his thoughts on his microblogging account. — Todd Woodbridge (@toddwoodbridge) 16 января 2018 г. Several users calling Sabalenka's screams "distracting" and "unbearable," blamed the player for the "unprofessional behavior." Good on them, screaming was excessive, pointless and unnecessary. — Jim Loton (@jim_loton) 16 января 2018 г. — Andrew Lampe (@burpbbpy) 16 января 2018 г. Other netizens took Sabalenka's side, feeling bad about the disrespectful way Barty's fans treated her. — Fabi-Hola! (@PliskoPova) 16 января 2018 г.
I will forever stan Aryna Sabalenka. What a talent. And what a bad behavior from the crowd…..
— Yoann. ♕ (@sweetbackhand) 16 января 2018 г. — Mona LeCruy (@Ashleyrpop) 17 января 2018 г. — Mich (@makomyday32) 16 января 2018 г. Respect for Ash's disapproval at the crowd mocking Sabalenka. It's gross, she's 19. — JIM (@cluuford) 16 января 2018 г. Controversy over grunting tennis players is nothing new, with Maria Sharapova, Victoria Azarenka, Novak Djokovic, Rafael Nadal and the Williams sisters known as loud vocalists on the court. Meanwhile, the WTA said in a statement to AFP that Sabalenka's actions weren't an issue in their eyes. "Grunting is a natural part of the game; there is a correlation between breathing, a forceful exhale and power," the WTA noted. "Excessive grunting doesn't seem to be an issue that affects players."